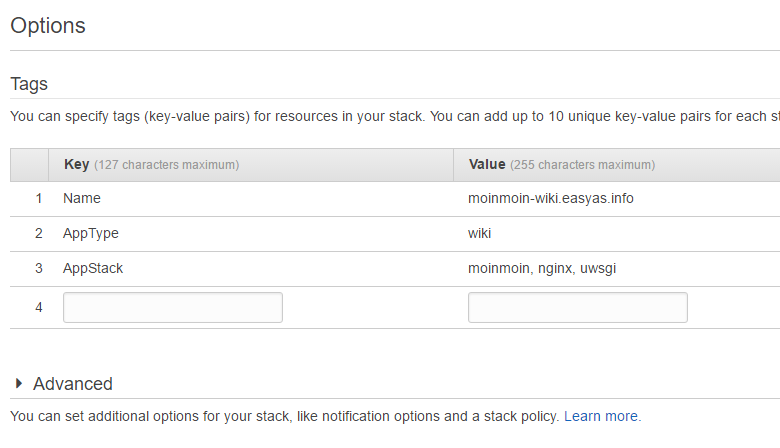 This post takes the Installing MoinMoin on Nginx and uWSGI post further by deploying the built instance of MoinMoin within an AutoScalingGroup (ASG). 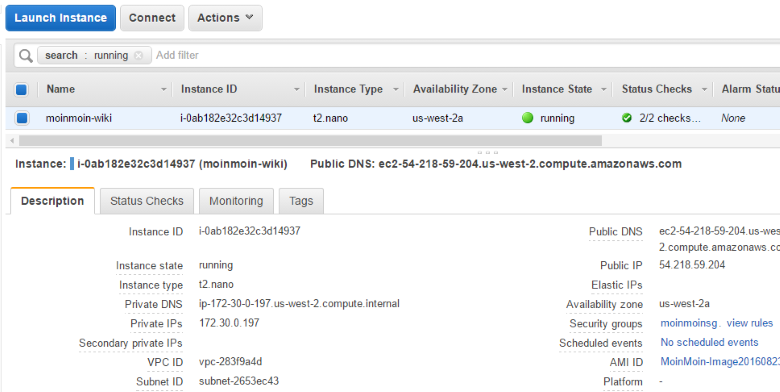 From my previous post of we have come out with a running instance configured as desired. The only trouble with this situation is that it’s a snowflake. 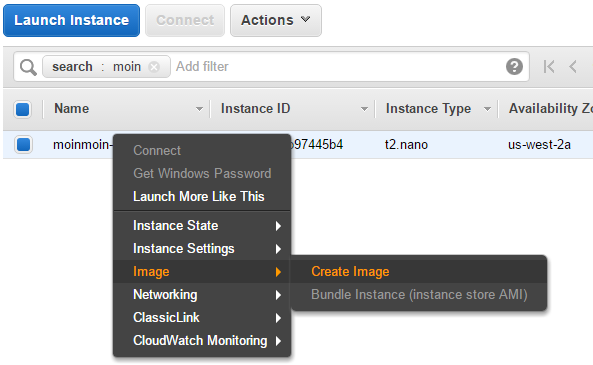 First step to producing a server that can be repeatedly recreated is to take a snapshot of the instance, this is as simple as choosing so in the AWS console and giving it a name. Take the time to describe your image so you can remember what it does down the track. It doesn’t typically take very long, certainly not with these tiny instances with only 8GB of disk. 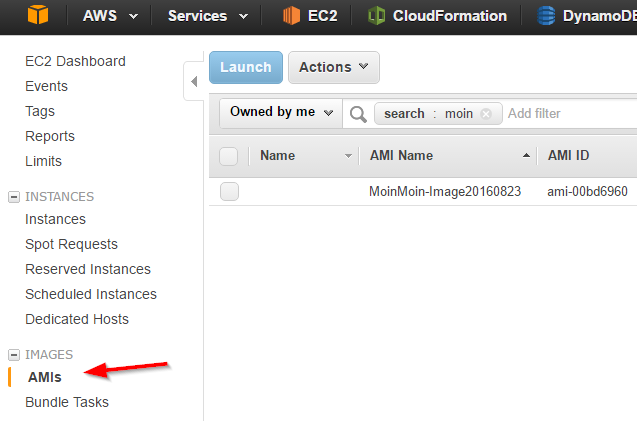 You can then find the created image under the Images > AMIs menu in the console. This AMI ID is what we’ll use in the next step. 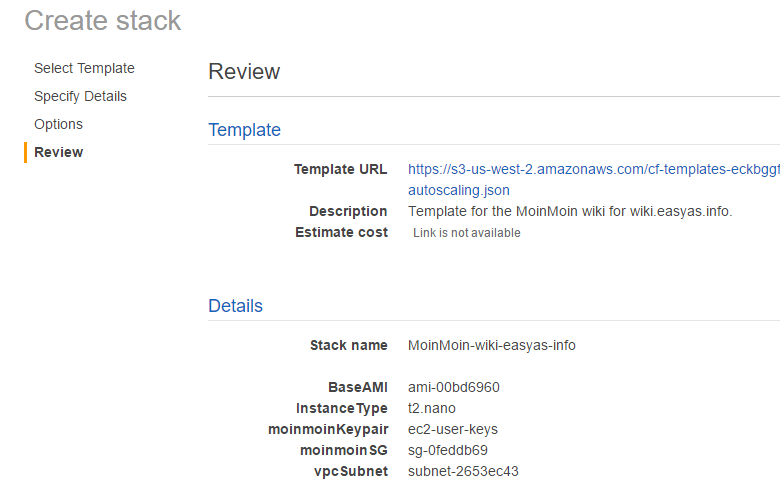 So now we’ve got an AMI, the next step is to create a CloudFormation template that will produce an ASG for the MoinMoin application to be served out of. In the Parameters section I’ll add a few options that might be needed to be tweaked at deployment time. 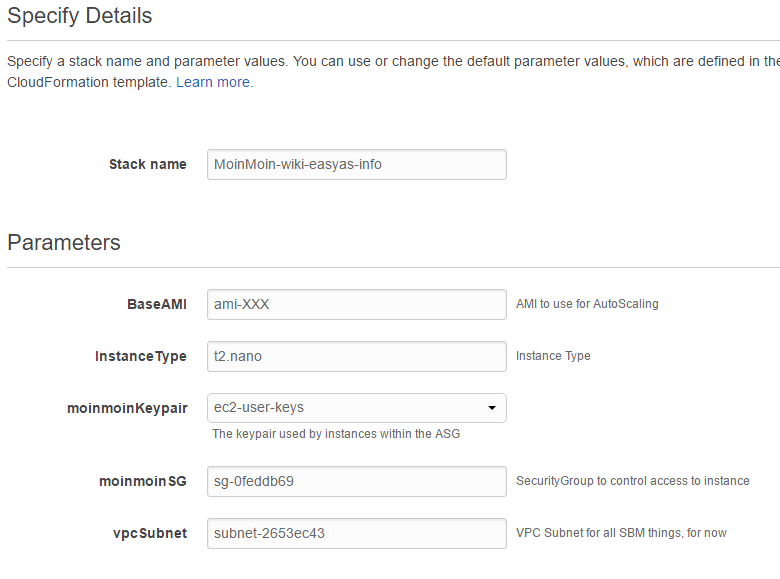 Properties such as the aforementioned AMI, the EC2 instance type and the VPC subnet to operate in. I’m cheating a little here by using a Security Group that I created manually for another project. Next up is the meat of the template, Resources, where the actual ASG is declared along with the LaunchConfiguration that it needs to know how to fire up instances. "#TODO call script to update IP in Route53 config for wiki.easyas.info"
An ASG is a really powerful way to provide reliability with minimal effort. The AutoScalingGroup is where we reference the above “moinmoinLC” LaunchConfiguration and declare the UpdatePolicy and the number of instances. 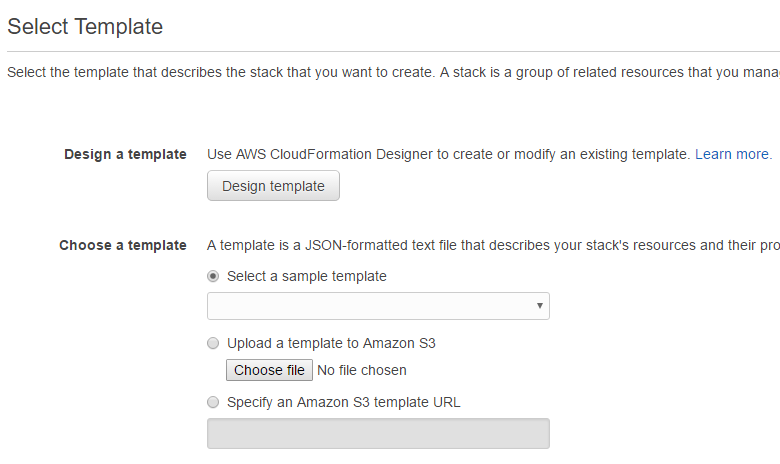 The UpdatePolicy is the way that CloudFormation knows how to transition from one version of a template to another. The DesiredCapacity is just that, how many instances we’d prefer to have. Having the MinSize and MaxSize both set to one simply ensures there’s always a new instance brought up if the running one were to fail with no more than one instance being provisioned at any one time. If things go smoothly, you’ll be able to see the template execute and end up in a clean “CREATE_COMPLETE” state. And of course, check out the site! Hope that helps demonstrate how easy it can be to fire up an Auto Scaled server with minimal fuss.